Package, 1 fitbit alta metal barcelet and 1 removal tool are in a gift box. High quality services, 100% money back guarantee if the fitbit alta band doesn't fit or meet all of your expectations. Special design for Fitbit Alta HR and Alta Fitness Tracker, Tracker is NOT included. 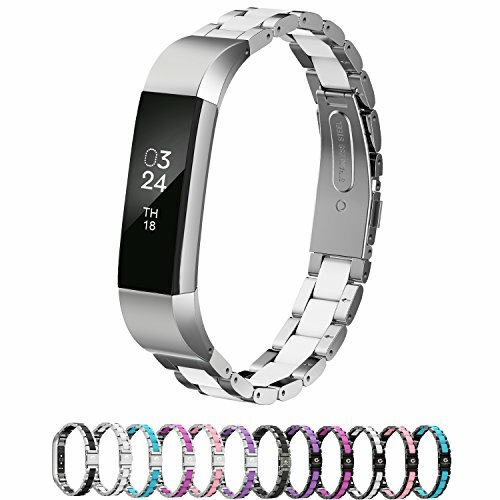 Personalized your Fitbit Alta Tracker with this refined replacement premium stainless steel band, stainless steel strap makes your Fitbit Alta a totally new classic and elegant look. The band length is 5.9"-8.46"(150mm-215mm),includes the length of the tracker. The Fitbit Alta wristband can be freely adjusted according to the circumstance of individual wrist with the removal tool. Adjustable design - Free adjustable length that you can adjust it according to the circumstance of individual wrist, securely and convenient to put on or take off it. Premium stainless steel material with silicone cover, it is comfortable, eco-friendly and safe for the your skin. It is a great craftmanship, elegent and luxry, but in afforable price. - Double Button Folding Clasp, enable you to lock or unlock without any hassles. - Comes with Fitbit Alta Smart Fitness Tracker Lugs on both ends, which locks onto Fitbit Alta Watch Band Interface precisely and securely. Easy and direct installation and removal. - Many colors or prints for your choice, white, black, purple, teal, yellow, rose, and black with skull-print. - Eco-friendly, low-key, elegant and practical. Best gift for yourself , your family or friends!